Registration for the 2015 Red Parka Pub Challenge Cup is open. Now in its 42nd year, the RPPCC is the longest-running, pro-style dual giant slalom race in the United States–more importantly it is a fundraiser event for the Eastern Slope Ski Club, which supports youth ski development programs in the Mt. Washington Valley. This year’s race is slated for Friday, March 20, at Attitash Mountain Resort. Both men and women skiers are welcome to compete. This is a 21+ race. The registration fee is $60 in advance or $70 on race day and includes a lift ticket, guaranteed two runs on the course, an official race hat, a raffle ticket and a free dinner at the Awards Ceremony served by the Red Parka Pub in Ptarmigan’s Pub after racing concludes. Registration forms are available at the Red Parka Pub in Downtown Glen or online at redparkapubchallengecup.com. Last year, the Red Parka Pub Challenge Cup raised $8000 for ESSC through proceeds from race entries, raffle entries and live auction items. If your business is interested in becoming a sponsor or donating an auction item, please contact Terry O’Brien at 603-383-4344. Major sponsors include Goslings Rum, Heads Skis and Sport Thoma. We are also proud to have continued support from Budweiser, Settlers’ Green Outlet Village, Valley Originals, SkiChair.com, Pepsi and Hurricane Racing. Settlers’ Green Outlet Village is joining the Jackson Area Chamber of Commerce in celebrating the 27th Annual Return of the Pumpkin People Contest, a self-guided, leaf-peeping tour throughout the Mt. Washington Valley. Settlers’ Green is calling to the community to join in on the spirit of autumn in the Mt. Washington Valley by entering the Settlers’ Green Pumpkin People Decorating Challenge. We will have 20 designated “naked” Pumpkin People dispersed throughout our shopping center and we are asking our stores and the community to help dress them. These displays will all be a part of the official Settlers’ Green Pumpkin People display that is judged in the Jackson Chamber’s Return of the Pumpkin People Contest. We welcome individuals from the community or local businesses, non-profit organization, and/or schools, as well as the stores at Settlers’ Green to join in this friendly competition. Competitors can get as creative as they want in expressing the message of their non-profit, business or store, all that is required is that it falls under the theme of “Happy.” The grand prize is $500 cash as well as runner-up prizes of $100 toward a company lunch at Brandli’s Pizza as well as Black Cap Grille. Register for free with Settlers’ Green by Monday, September 15, 2014. Your “naked” Pumpkin People display includes a pre-made body and real pumpkin head, all you need is to bring it to life with clothes, stuffing and face paint! Decorating for the Settlers’ Green Pumpkin People Challenge must be complete by September 26, 2014 at 4 p.m. The displays will be put to a vote during the Settlers’ Green Fall Festival event on Saturday, September 27 from 10 a.m. to 2 p.m. Winners will be announced on October 1. Displays will remain up and will be put to a vote in the official Return of the Pumpkin People Contest through October 31. If you are interested in competing, contact the Event Manager Laura Tuveson at 603-356-7031 x100 or laura@ovpmanagement.com to get a registration form. Settlers’ Green Outlet Village, located in North Conway, New Hampshire, is a 60-plus store outlet center with a unique village setting offering landscaped courtyards, cafés and restaurants, and a wide variety of outlet shopping experiences including Coach Factory, J. Crew Factory, Nike Factory and more. OVP Management Inc. will be hosting a month-long sweepstakes, May 1-31, 2014, at its Settlers’ Crossing stores. Prizes include a free mountain bike from Eastern Mountain Sports, a cash card from Northway Bank and a food lovers prize pack for Starbucks, Black Cap Grille and Subway. With over $1000 worth of prizes, it is encouraged to enter once per day during your daily routine at participating stores at the shopping center. The sweepstakes runs May 1-31, 2014. No purchase is necessary. Look for entry boxes at Orvis Outlet, Eastern Mountain Sports, Clarks Bostonian Outlet, Starbucks, Subway, GNC and Northway Bank. Settlers’ Green Outlet Village, a 60+ outlet shopping center, as well as Settlers’ Crossing, a mix of national name brand retail and restaurants, are located in North Conway, New Hampshire. The two shopping centers are developed and operated by OVP Management, Inc.
It’s Opening Day in Boston on Friday, April 4, and Settlers’ Green Outlet Village is showing its hometown spirit with free Wally The Green Monster cupcakes to the first 100 Red Sox fans to visit the White Mountain Cupcakery in team apparel. The store opens at 9 a.m. and cupcakes will be available while supplies last. The store will also have coupons to save $2 on four or more cupcakes, so stop in–Red Sox gear or not–for the offer on Friday. There will also be raffles for Red Sox hats from Lids including the official 2014 World Series Champion Red Sox hat. Entries will be available at the cupcake shop. The White Mountain Cupcakery, which opened its second North Conway location at Settlers’ Green last October, is located by Gap Outlet and Aeropostale. This event takes place at the Settlers’ Green location only. 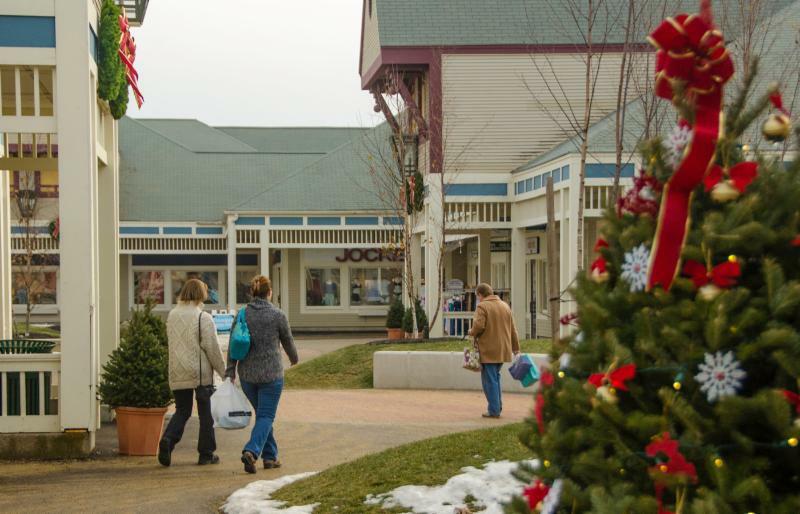 Settlers’ Green Outlet Village is a 60+ outlet shopping center with a mix of national name brand retail outlet stores and restaurants, located in North Conway, New Hampshire. The center hosts events throughout the year. For more information on upcoming events at Settlers’ Green, visit settlersgreen.com. 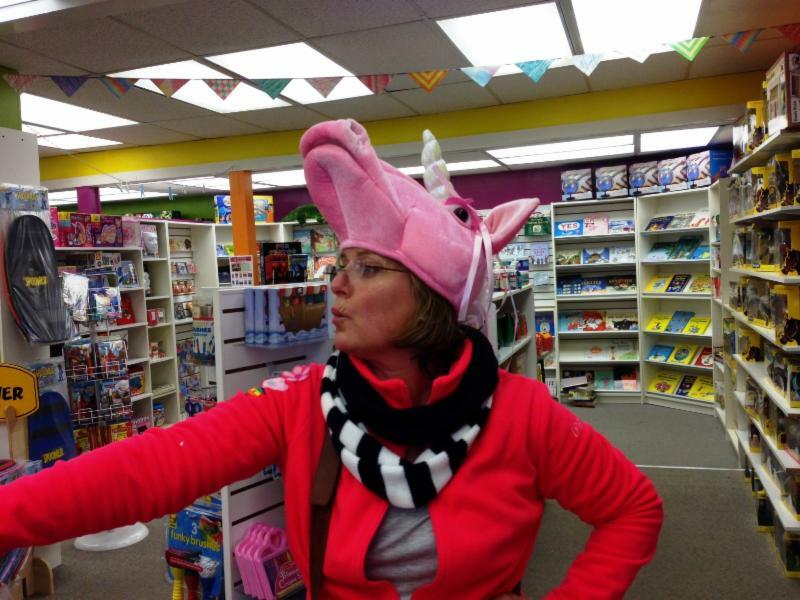 Tax-Free Shopping in North Conway, NH! We’re here to talk SHOP(ping). Presented by the Mt. Washington Valley Chamber of Commerce, Settlers’ Green Outlet Village and The Shops of North Conway Village, this weekly newsletter will provide tax-free shopping ideas throughout North Conway, holiday shopping tips, local event listings, shopping packages and everything you need to plan a great shopping getaway. We’ll even throw in some coupons. We’ve enjoyed bringing Shop Talk to you throughout the past eight weeks. This will be our final issue of Shop Talk, but we are very interested in learning what you thought about it. Would you be so kind as to complete a short survey? One lucky person who completes the survey will win a gift pack of gift cards and certificates for shopping in North Conway. Please click here to take the survey. Anyone with kids is on the lookout for good ideas for teachers and hostess gifts. While you’d think they’d be easy to find, selecting something meaningful and memorable can be a challenge. Fear not, however, North Conway is filled with great gift ideas this holiday season. Read on for some nice ideas for the teachers on your list and for hostess gifts too. Every hostess would love one of the incredibly cool fork and spoon figurines found at the Naked Bohemian. 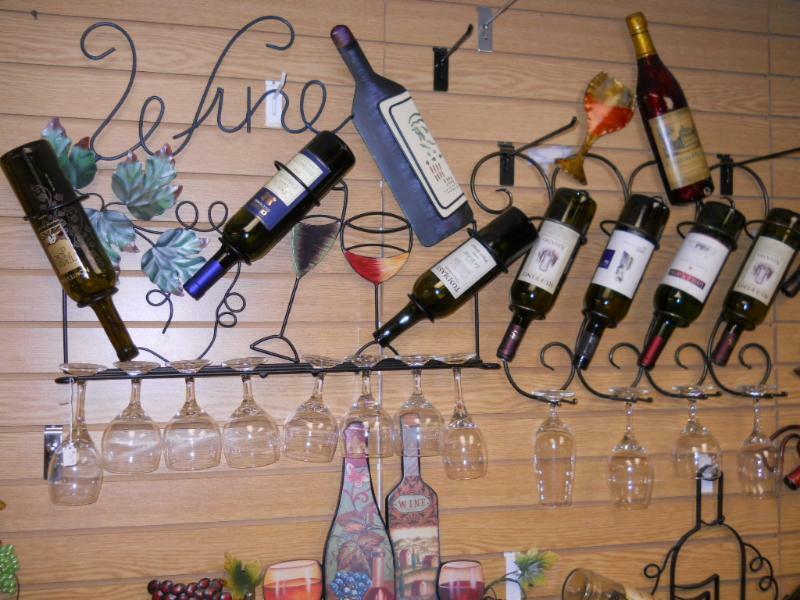 Here you’ll find a wide variety of handmade wine caddies, yard ornaments and more. Additionally, Leila Rose carries a lovely selection of unique home furnishings that might make the perfect gift for teachers or hostesses. Spruce Hurricane carries a fabulous collection of accessories. They’re also the exclusive Pandora retailer in the Valley. For both teachers and hostesses, stop into Lindt Chocolate Shop where you’ll find 75 chocolate truffles for $25 and special gift bags too. One stop for both teachers and hostess gifts! Everybody loves Starbucks and Subway. How about a gift card from either of these, both located in Settlers’ Crossing? Click here for more teacher and hostess holiday gift ideas, including where to find $1.99 gadgets and soaps and lotions starting at $3. We’ve scoured the stores in North Conway for the best treasures, special offers and finest finds so we can share them with you. Some are reminders on where to find the best deals, others are very special discoveries or novelties for holiday shoppers. Remember, all of these come tax-free so what you see on the price tag is what you pay! * Skiers and Boarders: Great deals on 2012 and 2013 skis and boards at Joe Jones’ Sun & Ski Sports in North Conway; look for recreational Nordic skis too. For those seeking Nordic/Telemark skis, Eastern Mountain Sports at Settlers’ Crossing also offers the region’s largest collection of equipment for back country terrain. 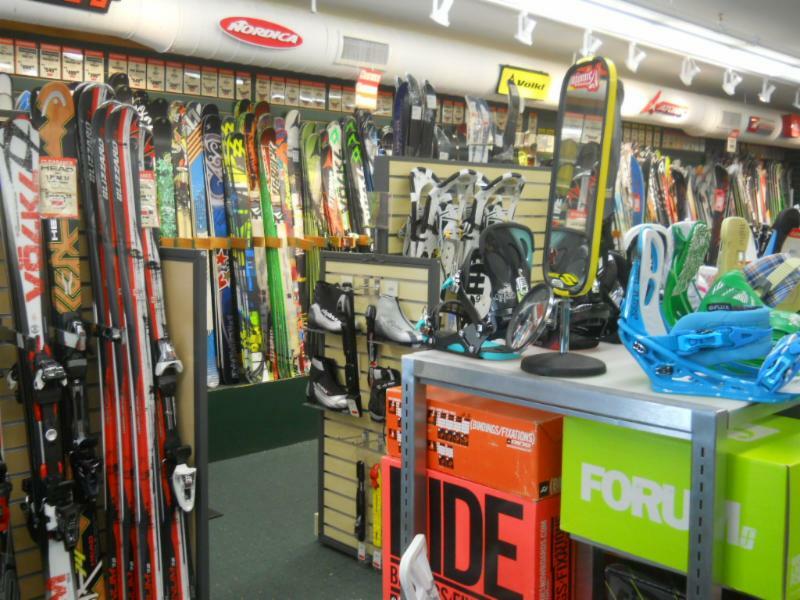 Bob & Terry’s Sports Outlet, located between North Conway Village and the outlets, is another great option for skiers and boarders looking for gear and apparel. Rent skis at the Great American Ski Renting Company in North Conway Village too. 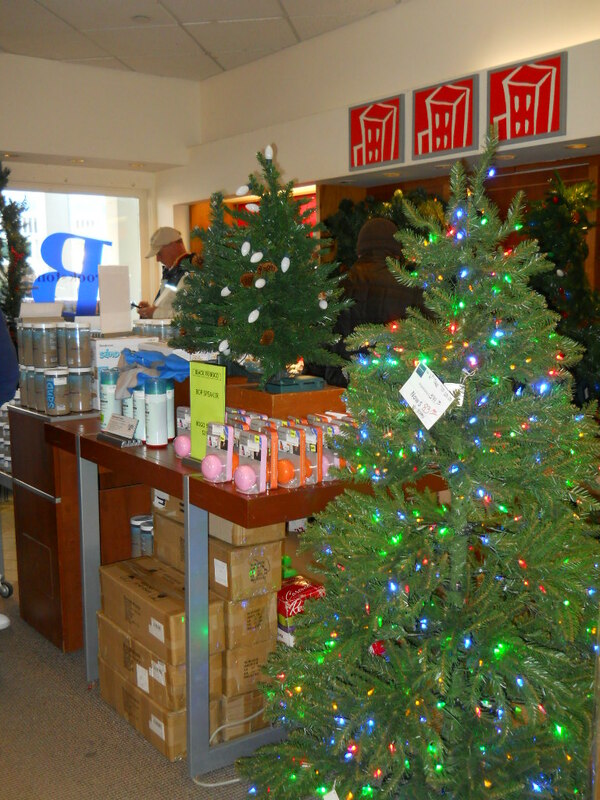 * Great stocking stuffer “find”: Look for JACKS at Brookstone Outlet in Settlers’ Green. They are a cell phone stand, a screen cleaner, a cord wrap and a stylus, all in one – teens and tweens will love them. * Be sure to check the Orvis Outlet at Settlers’ Crossing for the Deal of the Week, offering a number of special deals on everything from pet supplies and gear to clothing and more. 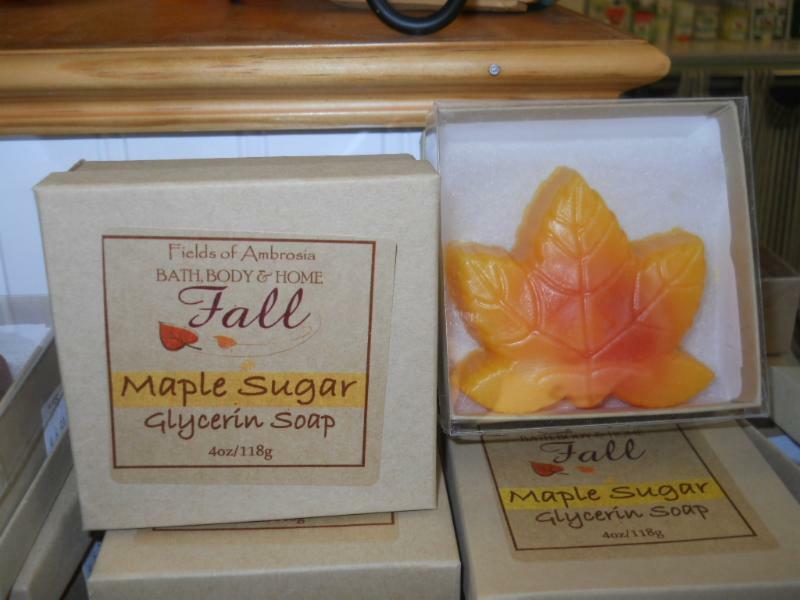 * Fields of Ambrosia in Norcross Circle makes seasonal soaps; the perfect stocking stuffer for just $3 each. Locally made right in North Conway too. Visit www.settlersgreen.com/on-sale for the most up-to-date sales and featured products at Settlers’ Green Outlet Village. 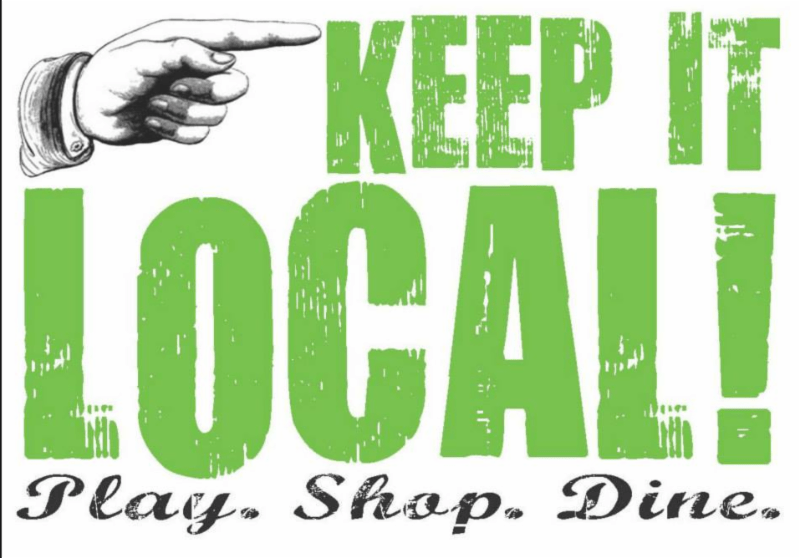 And click here for a full list of shopping options throughout Mt. Washington Valley. The winning photo! Lori and Barbara with Santa. Lori and Barbara note: “We have a great time in North Conway, enjoying the scenery, village shops, restaurants and, of course, the bargain shopping… You’ll notice in the photos the special shirts we made for this year’s event… the moose on the shirt says “Love,” and a reference to our time in North Conway. 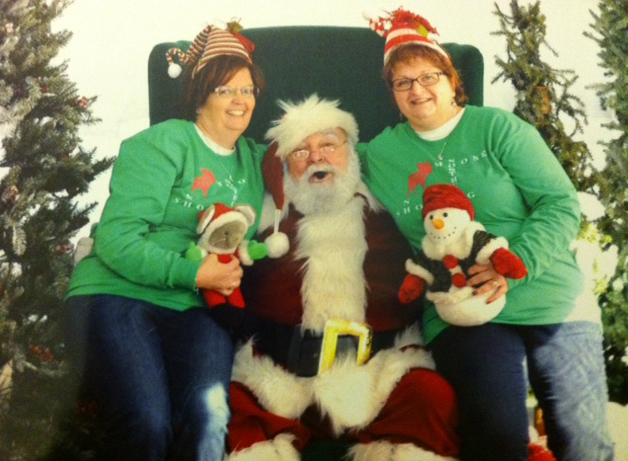 Lori and Barbara’s photo with Santa received the most likes on the Mt. Washington Valley Chamber’s Facebook page in our Shopping photo album, and is the winner of our Shopping Photo Contest. Lori and Barbara have won a shopping getaway complete with overnight accommodations and gift certificates to North Conway Village stores and restaurants! Congratulations, Lori and Barbara. A big shout out also goes to “The Bag Ladies” who submitted a number of photos and garnered several hundred likes for their photos. 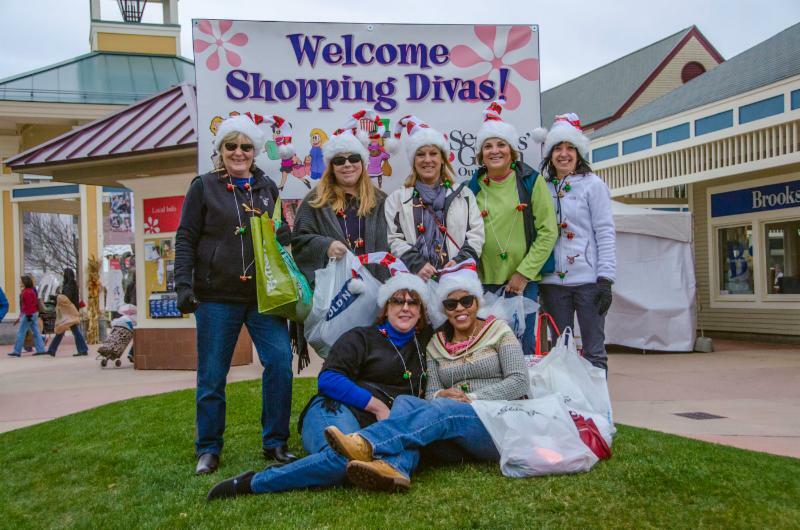 Great job to all eleven of the “Bag Ladies” – we hope you’ll return again! Deb W. from Falmouth, MA. Deb will be awarded an overnight stay at Colonial Motel and a collection of gift certificates and gift cards for North Conway shopping and dining. Congratulations, Deb! Have a question about where to locate a hard-to-find item, or find the perfect gift for your next door neighbor? We’re here to help! Send your questions via email to PR@mtwashingtonvalley.org. Here are solutions to several shopping dilemmas we’ve uncovered, all easily solved in the stores throughout North Conway. Q: I like to give locally made or Made in the USA gifts at the holidays. Where could I find things that were locally made? 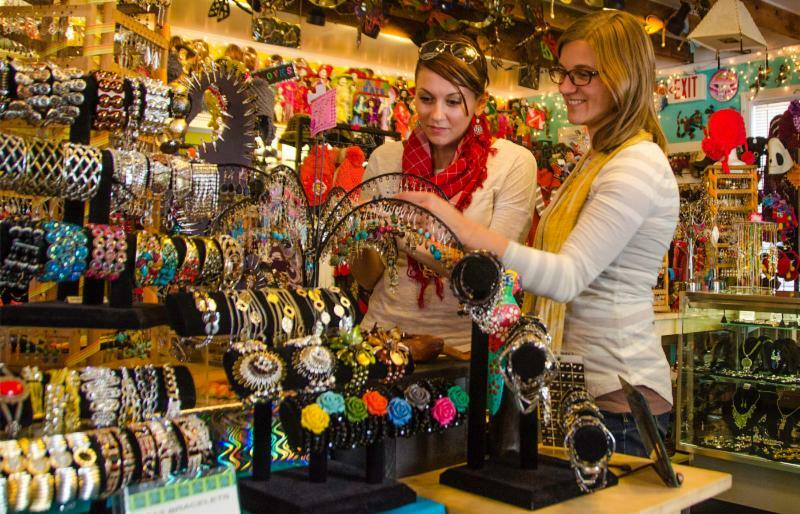 A: There are a number of options to find locally made gifts in or near North Conway Village. A few that come to mind immediately are the chocolate gifts made on premise at the Bavarian Chocolate Haus in North Conway. Their truffles are especially popular at holiday time. Zeb’s General Store in North Conway Village is known to have the largest collection of New England-made specialty foods in the country, so you can’t go wrong there. In fact, everything at Zeb’s is made in New England. The White Mountain Cupcakery, with locations in Settler’s Green and North Conway Village, makes delicious cupcakes.Visit the Skinny Towel Company in the pink Handcrafters Barn, near North Conway Village or the Funky Bubble in North Conway Village offering locally made Kearsarge Mountain Goats Milk soaps and sundries. Fields of Ambrosia in Norcross Circle also offers made-on-premise soaps and fragrances and right next door, Jewelry by Timothy W. Psaledakis & Friends, specializes in custom-made-to-order jewelery. Frontside Grind in North Conway Village will create a customized roasted coffee too (10 lb. minimum) and the League of NH Craftsmen offers art pieces, jewelry, pottery and gifts for the whole family, made in NH. Essence of Art on Kearsarge Street offers a wide range of affordable gift ideas, all made on premise by disabled adults. There are so many places! This is just a few ideas. Q: We’re expecting a heavy snow winter. I’m looking for gift ideas to keep the kids busy on snow days. A: You have a number of options. Visit the Toys R Us Outlet in Settlers’ Green, the toy section at Zeb’s General Store or Toy Chest in North Conway for some popular toys. 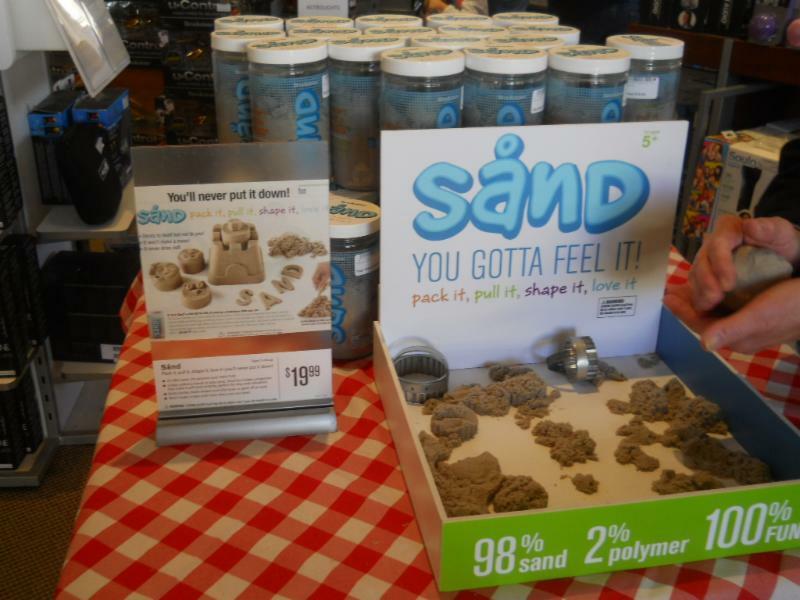 However, here’s an idea for something new and different: The Brookstone Outlet in Settlers’ Green has a product called Sänd. It’s 95-percent fine quality sand and 2-percent polymer, so it sticks together and doesn’t end up all over the table or play surface. You can mold it and it feels really cool to the touch. It’s a nice departure from Play Doh, and easier to clean up. A nice size package is $19.99. Holiday cheer at Settlers’ Green. Photo by: Dan Houde/Wiseguy Creative. 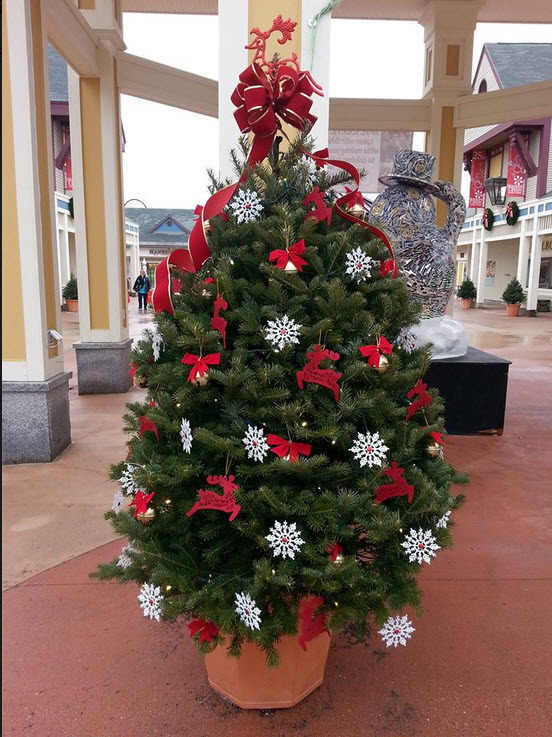 Shop and play at the Settlers’ Green Holiday Tree Festival on Saturday, December 7th from 11:00 am to 3:00 pm, where the whole family will get in the spirit of the holidays. In addition to holiday shopping, the day will be filled with caroling, festive trees decorated by local businesses and civic groups, free hot chocolate and candy canes, and free horse-drawn wagon rides with Santa. Plus Cranmore Mountain Resort will create a free miniature snow-tubing park, and C-more the Penguin will be on hand to get everyone in the spirit for ski season! While the kids play, Mom and Dad can shop! How does a free weekend getaway to North Conway sound to you? It comes complete with a two-night stay at Stonehurst Manor, lunch at Black Cap Grille and a $500 shopping spree at Settlers’ Green Outlet Village. 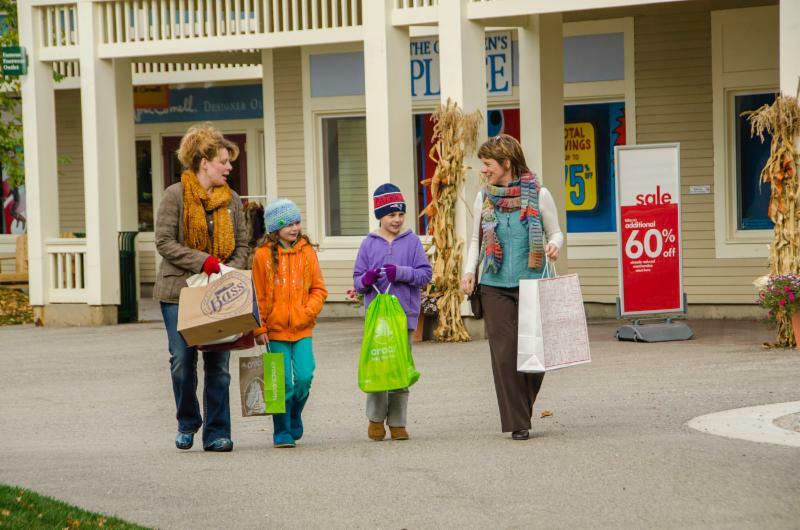 It’s all part of the New Hampshire Shopping Sweepstakes from VisitNH – New Hampshire. Click here for more details and to sign up to win! Won’t You Shop and Stay a Little Longer? With so much to see and do in the Mt. Washington Valley, why not stay a little longer? Along with tax-free shopping, hike the mountains; attend events and enjoy the holiday festivities; dine at unique restaurants and then stay the night and do it all the next day too! Shop ’til you drop and then stay the night, the weekend or even the week! 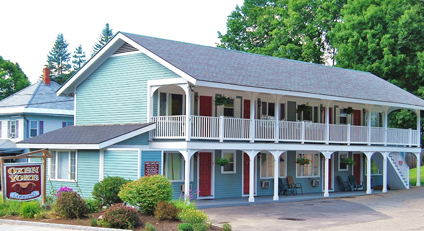 The Oxen Yoke Motel is tucked away on Kearsarge Street within easy walking distance to North Conway’s shops and restaurants, making it a great lodging choice for your next shopping trip. Take advantage of Oxen Yoke’s Shopping Getaway Package and receive a shopping bag filled with exclusive discounts and coupons to various North Conway shops and restaurants, samples, a water bottle and other shopping essentials. Package pricing starts at $72 per night per room and varies depending on the type of room booked. Call Oxen Yoke toll-free at 800-862-1600 to book your Shopping Getaway package. 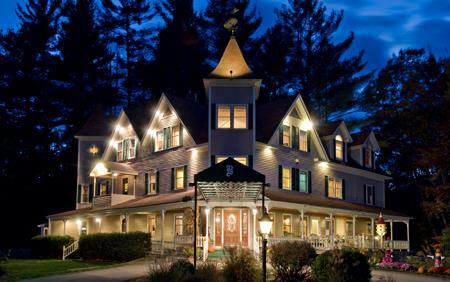 Take advantage of all the tax-free shopping North Conway has to offer and then spend the night at the romantic Bernerhof Inn in Glen, New Hampshire. The Bernerhof’s Shopping Escape package includes deluxe overnight accommodations, a Welcome Basket filled with items from Zeb’s General Store, Settlers’ Green coupon book, free gift wrapping, a full cooked-to-order gourmet breakfast, afternoon refreshments and warm home-baked goodies. Package pricing ranges from $169 for one night to $299 for two nights. Pricing is based on double occupancy, and restrictions may apply. Package pricing valid through December 21, 2013. 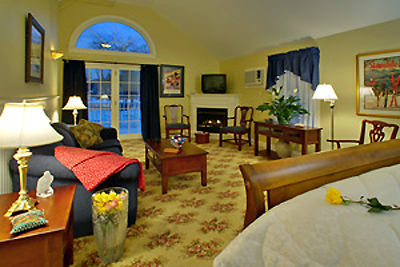 Call 603-383-4200 or toll free at 877-389-4852 to reserve your Shopping Escape Package at the Bernerhof Inn. Black Friday shopping at Settlers’ Green. 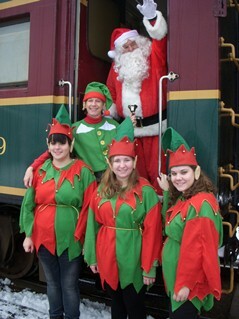 Santa is on board the Conway Scenic Railroad with his mischievous elves who will be sharing their hot chocolate and cookies with everyone. They’ll take your picture, too, if you ask nicely, so be sure to bring your camera! 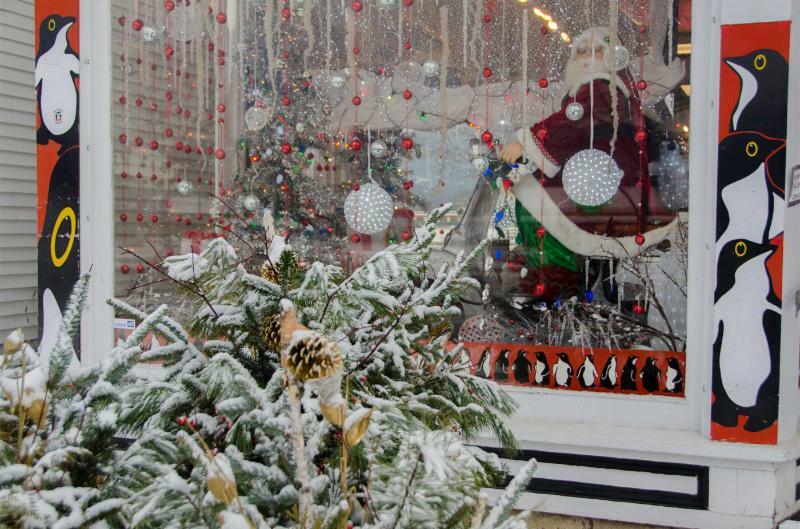 Ho, Ho, Ho – Santa Claus is coming to Settlers’ Green Outlet Village. He is a busy man at this time of the year, but will be visiting Settler’s Green at 11:00 am each of the days listed above. Come to Settler’s Green to enjoy caroling, festive trees, free hot chocolate & candy canes, free horse-drawn wagon rides with Santa, Cranmore’s miniature snow-tubing park and much more! A holiday party and artisan show wrapped up in one. There will be over a dozen artisans showing their crafts at Delaney’s Hole in the Wall from 5:30 to 8:00 pm, with beer and wine tastings and food specials too. Holiday boutique at the North Conway Community Center starting at 9:30 am. The boutique will include unique floral arrangements, holiday decorations, and other creations popular as gifts. For more event listings, visit the events page of the Mt. Washington Valley Chamber of Commerce website, and don’t forget about the Valley’s wide array of attractions and recreational opportunities to complement your shopping trip! Bienvenue de la Vallée du Mont Washington! Bienvenue à nos voisins canadiens! Nous avons hâte de vous accueillir pour votre magasinage sans taxe dans le village de North Conway et chez Settler’s Green Outlet Village. Vous trouverez des boutiques exclusives dans la vallée du mont Washington. Cliquez ici pour plus d’information au sujet de notre région et des itinéraires de voyage en français. Stop at any one of our Information Booths when arriving in the Mt Washington Valley. Download the Chamber’s free app for the most comprehensive list of Mt Washington Valley businesses and events. FREE $5 Gift Card with every $50 Gift Card purchase. Makes the perfect gift for someone this holiday season. 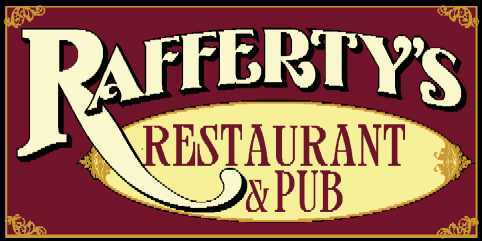 Rafferty’s Restaurant & Pub, 36 Kearsarge Street, North Conway Village. Offer Valid through December 31, 2013.
and receive free exclusive offers. Click here and here to view coupons in the free Mt. Washington Valley & North Conway Village Shopping Guides. Pick up your guides at participating businesses and at the Mt Washington Valley Chamber of Commerce Information Booths. 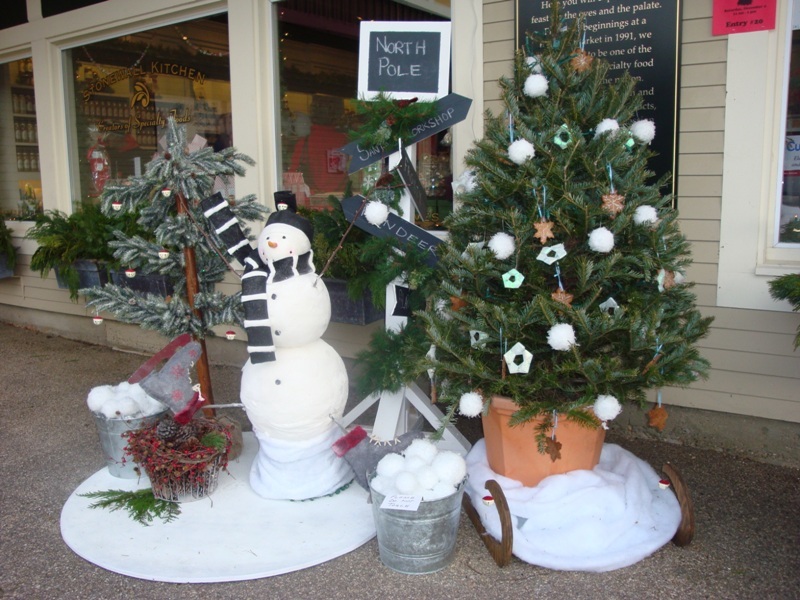 Get Your Shop On in North Conway Village, NH! It’s Harvest to Holiday time in North Conway. 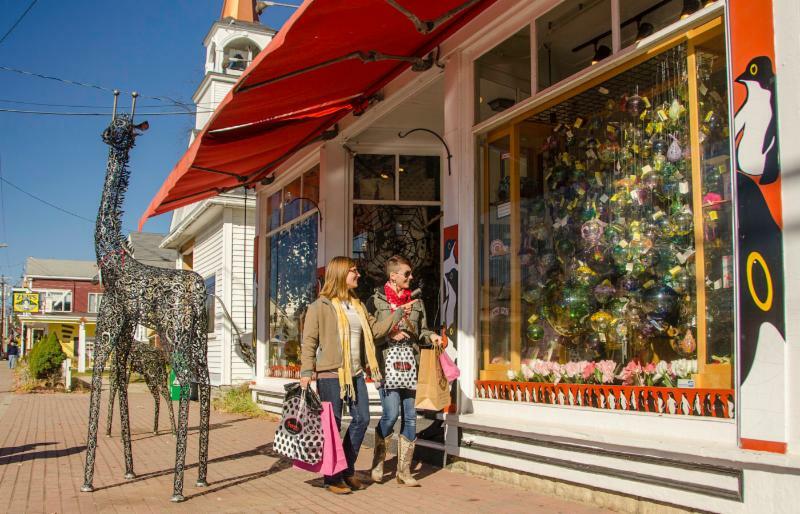 It’s beginning to look a lot like holiday shopping season in North Conway! 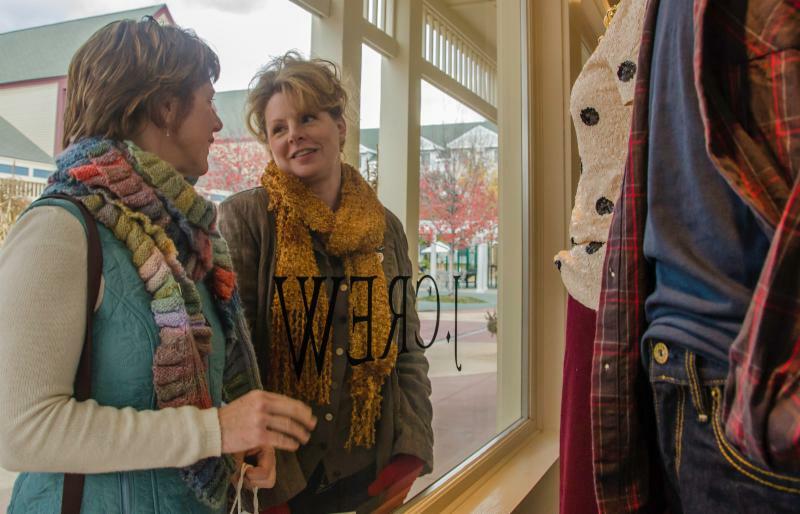 Grab a shopping buddy, hit North Conway’s outlets, shops and independently-owned stores and start crossing gifts off your holiday list! Read on to get some great gift ideas for the kids this holiday season, where the “finds” are in the Valley and all about how to win a gift certificate for your shopping getaway. Drive safely on your way up to tax-free New Hampshire! Kids are always so much fun to shop for during the holidays. Full of wonder, the holidays are all about bringing smiles to the faces of the younger set. From infant to “tweenager,” North Conway is packed with ideas for toys, apparel and goodies that the kids will love. 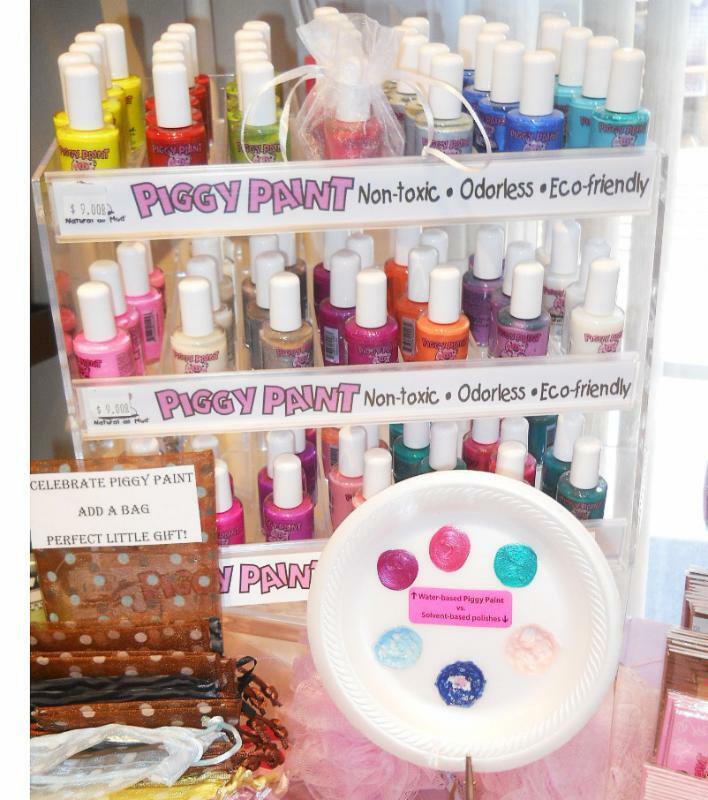 You won’t be able to resist the Piggy Paint for your kids this holiday at The Funky Bubble. It’s about as natural as mud, but much more colorful! It’s also a non-toxic, odorless and eco-friendly way to paint just about everything. The gift shop at the Weather Discovery Center offers some great one-of-a-kind gifts and books for your budding meteorologists. Looking for a new lunchbox for your little one? The Chef’s Market of North Conway has the most adorable collection of metal lunch boxes for the kiddos on your list! Toys R Us Express, in Settlers’ Green, is filled with all the Legos, dress up, dolls, trucks, games and hot holiday toys for the kids. This is a great spot for stocking stuffers and “under $5” gifts too. It’s easy to find gifts for the kids in North Conway! Click here to find out where you can find chocolate treats made in the shape of their favorite sport, where to find warm boots and glittery party shoes, and much more. * Royal Doulton/ Wedgewood offers a clearance section starting at 40% off (as the holidays near, the sales here get even better!). No seconds, just first quality collectables, dinnerware and glassworks. * Skiers and Boarders, check out the Clearance Loft at Joe Jones’ Sun & Ski Sports in North Conway for some great apparel. You’ll also find nice sales at Olympia Sports, also in the Village, and Bob & Terry’s Sports Outlet, on Route 16 between the Village and the outlets. * LIDs in Settlers’ Green offers free embroidery on any order of 12 or more hats. Bring anything you need embroidered into the store, and they can usually find a way to personalize it, even if you didn’t buy it there. Embroidery starts at $9.99 per item. Modeling hats! Photo submitted by: Courtney L.
“Each woman has a personalized jacket, badges for the years they have participated, initiation challenges for new members, and our team name “Bag Ladies” on the back. We can’t wait to return next year!” – Courtney L.
Submit Your Photos to the Photo Contest: Submit your own photos of shopping fun in North Conway and you’ll qualify for a shopping getaway prize package including gift certificates from Settlers’ Green Outlet Village and North Conway Village retailers! Email your photo to PR@mtwashingtonvalley.org with your name and address. We’ll post the photos on the Mt Washington Valley Chamber’s Facebook page in our Shopping photo album. Tell all your friends and fans to like your photo, as the one with the most likes will be the winner! 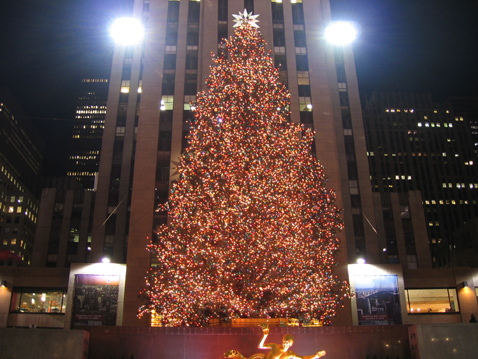 Send your photos anytime through December 1, 2013. We will announce the winner in this Shop Talk newsletter and on Facebook on December 4th. The winning photo will be the image that best depicts the fun of shopping from Village to Village – North Conway Village to Settlers’ Green. Your Chance to Win! One lucky Shop Talk reader will be awarded a Settlers’ Green gift certificate or a North Conway Village Association gift each week! We’ll randomly choose a name from among our readership and award him or her a gift each and every week. Be sure to tell your friends and family to go to www.ShopMWV.com to sign up and they might be winners too. Indicate an interest in Shopping when you sign up! 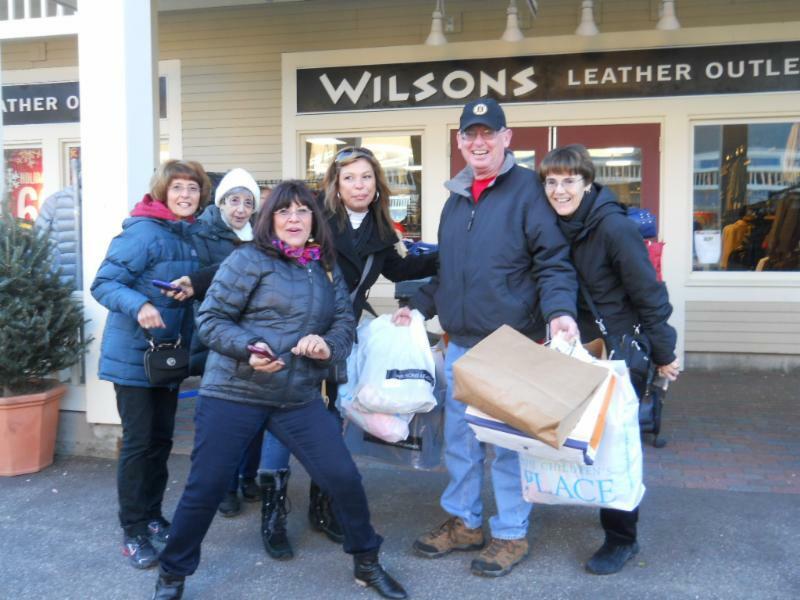 Here are a few great photos of shoppers enjoying all the Village to Village shopping from North Conway Village to Settlers’ Green Outlet Village the past few weeks. Enjoy, and we hope to see you in North Conway on your own shopping trip soon! Many thanks to Dan Houde of Wiseguy Creative for these photos! Q: My mother and father are walkers, but I worry about them falling in the winter when there’s snow on the ground. 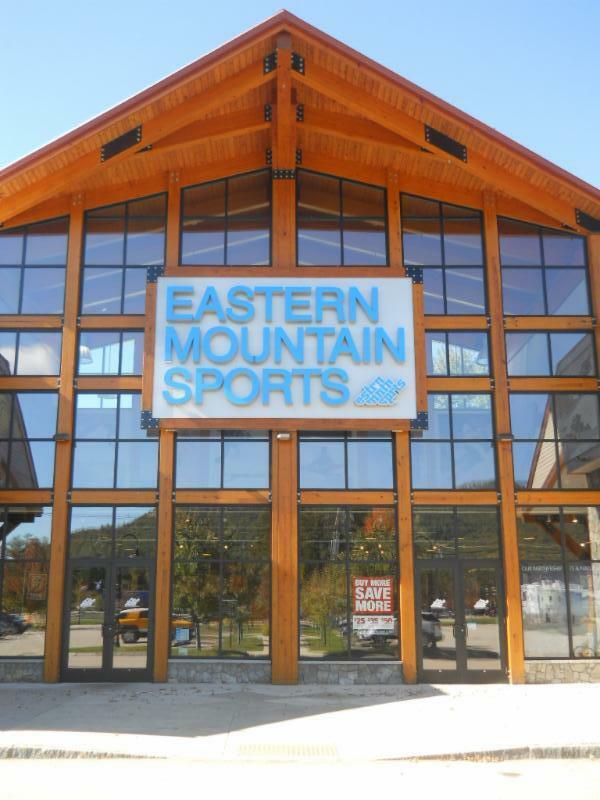 A: Visit the Eastern Mountain Sports (EMS) store at Settlers’ Crossing. Their Microspikes traction systems are perfect for winer! They are slip-on traction that easily fits over shoes or boots and offers plenty of traction for the winer. They are very popular and EMS carries a number of different styles. Q: One sister is rather large and the other is rather small. Any ideas where I might find sweaters or dresses for them this holiday season? A: We have two ideas. Lane Bryant at Settlers’ Green stocks apparel and lingerie sizes 14 to 28 (and bras up to 48DDD). The store is filled with great holiday and winter apparel. Dress Barn, also in Settlers’ Green, offers not only a petite section but also a Misses section with selections up to size 24. Q: I’m looking for the perfect gag gift for my friend. She’s turning 50 this year. A: We’ve got it! Visit Zeb’s General Store in North Conway Village for a Portable Hot Flash Fan. It fits in a purse, it really does work, and it’ll get a smile. There’s a nice collection of “hot flash” signs and gifts there too. Finally, if she’s a TV fan, we loved the Big Bang Theory Sheldon bobble head doll or the Duck Dynasty Year of Beards calendar at BAM! in Settlers’ Crossing. 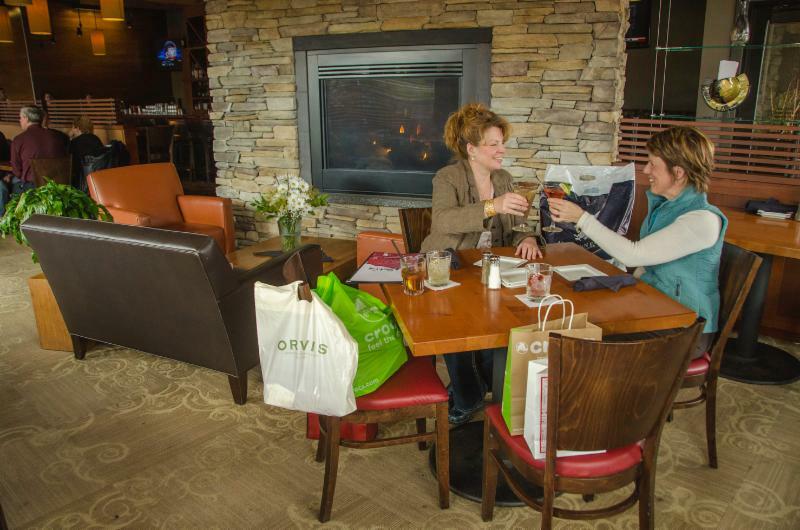 Kearsarge Inn Midweek Shopping Package: The Kearsarge Inn, located in the heart of downtown North Conway and just steps from all of North Conway Village’s shops and boutiques, is an ideal place to call home during your shopping getaway. The inn offers luxurious accommodations with jetted tubs and gas fireplaces, and is totally walkable to the restaurants in North Conway Village and a short drive from Settlers’ Green Outlet Village. Take advantage of the Kearsarge Inn’s Midweek Shopping Package with pricing starting at $89 per room (plus tax) for a Select room and $129 for a Luxury Room (Sunday – Thursday; not valid during holiday and vacation weeks). The package includes one night’s lodging, a $10 gift certificate to Zeb’s General Store and a $25 gift certificate to Settlers’ Green Outlet Village. 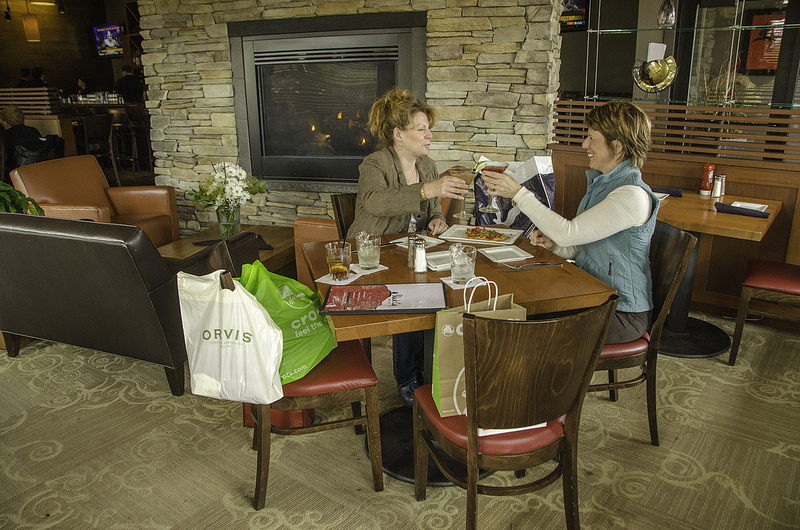 Call the Kearsarge Inn at 603-356-8700 or toll free at 855-532-7727 to reserve your Midweek Shopping Package. 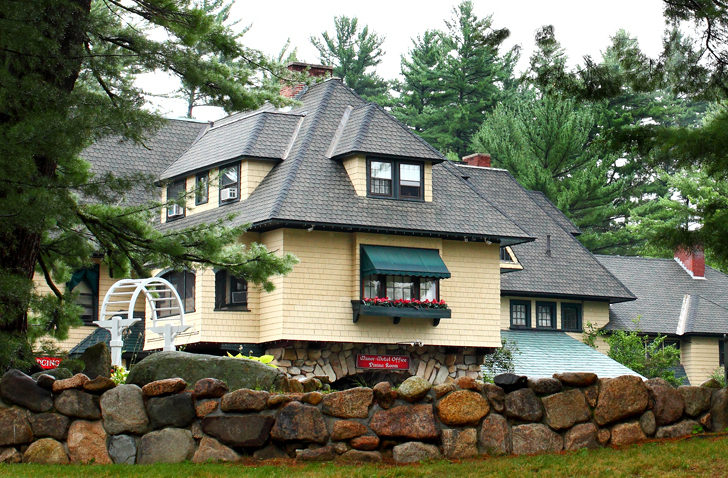 Stonehurst Manor Holiday Shopping Lodging Special: Stonehurst Manor, a turn-of-the-century manor in North Conway, offers manor rooms and condo accommodations, complete with mountain views,Jacuzzis and fireplaces in select units. Top it off with an award-winning restaurant and you’ve got the perfect place to come back to after a day of shopping. During the holiday shopping season, the Stonehurst Manor offers a relaxing night away ranging in price from $68 to $98 per person per night, depending on the choice of room. Pricing includes one night’s accommodation any night of the week, a full dinner and breakfast, and it’s all just a short drive to North Conway Village and Settlers’ Green Outlet Village. This pricing is valid from November 28th through December 22nd, and a two-night stay is required on weekends. Call Stonehurst Manor to book a Holiday Shopping Lodging Special today at 603-356-3113 or toll-free at 800-525-9100. Word in the stores says certain gifts are trending big this year. Tune in each week to learn about a few more trends. Vintage and ethnic looks are back, especially in jewelry! If a wedding is in your future, or if you are looking to update your wedding bands, Zale’s in Settlers’ Green is carrying the exclusive Vera Wang collection of vintage diamond wedding sets and engagement rings. Anything personalized always makes a great gift, and Kay Jewelers is able to monogram or engrave virtually any piece of jewelry. In North Conway Village, visit Tim at Jewelry by Timothy Psaledakis & Friends to consult on a customized design for your very special rings. Vintage includes wearing something sheer and pretty with something warm and bright. 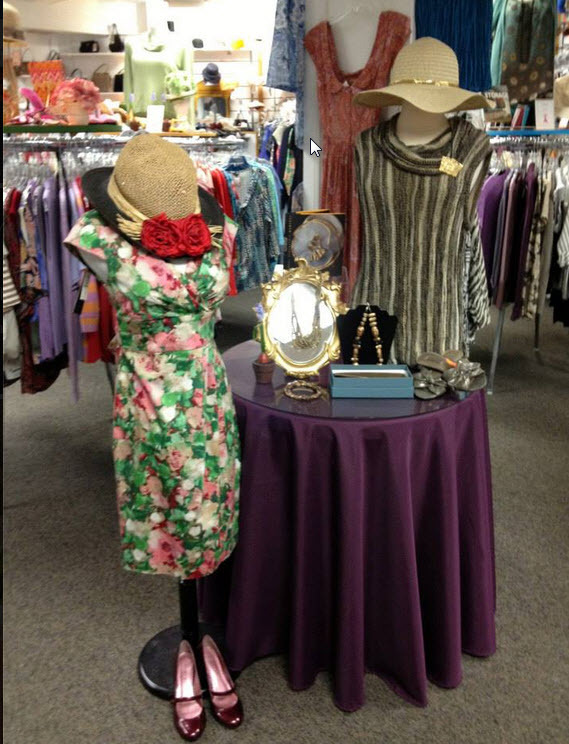 Check out Old Navy, Journey’s and Aeropostale in Settlers’ Green or It’s My Girlfriend’s Consignment Boutique in North Conway Village for affordable and fun vintage tops, dresses and accessories. Bring in a non-perishable food item and receive 10% off your purchase at the Sap House Meadery! Bring 4 cans of food, or 2 lbs. of dry goods and your electric or acoustic guitar to North Conway Music Center from 10:00 am to 5:00 pm, and get free strings and/or restring your instrument free of charge on the spot! After collecting all donations, North Conway Music Center will add $100 in food themselves and donate all the goods to Vaughan Community Services. A day (and night) of shopping madness at Settlers’ Green Outlet Village. All stores open at 5:00 am on Friday, with many stores opening at midnight. Free gift to the first 200 shoppers at midnight. 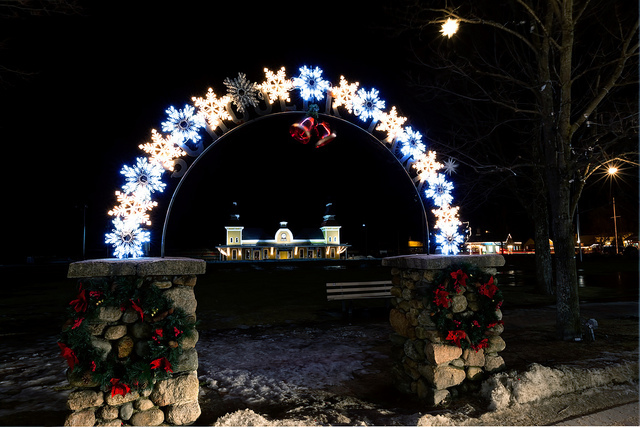 Celebrate the holidays with the Snowflake Festival in North Conway Village! This event will caroling, a tree lighting in Schouler Park, hot cocoa and activities such as face painting and card making, plus special Snowflake Festival and Small Business Saturday sales, specials and promotions in stores throughout the Village. Over 30 crafters on all three floors in the lodge with live demonstrations. Raffle and bake sale to benefit Great Glen Bill Koch Club Junior Skiers. Join the fun! 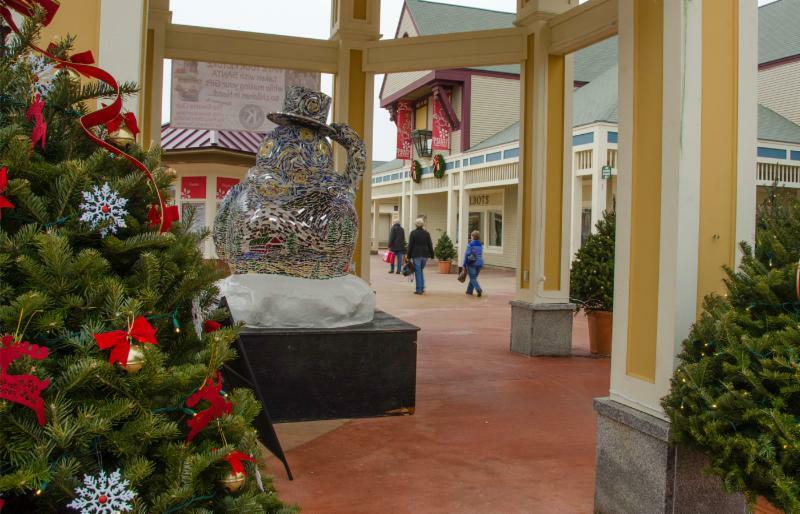 Settlers’ Green Outlet Village announces another new tenant for Spring 2013, with Crabtree & Evelyn expected to open in mid-May at the North Conway-based outlet mall. A pioneer in botanical formulations for 40 years, Crabtree & Evelyn is a brand that blends the very best of nature and science, tradition and innovation, and luxury and comfort to create benefit-rich bath, body, and home care. For more information on Settlers’ Green Outlet Village, its new stores and upcoming events, visit settlersgreen.com. You’re Invited to Waterford, Wedgewood, Royal Doulton’s Holiday Party! 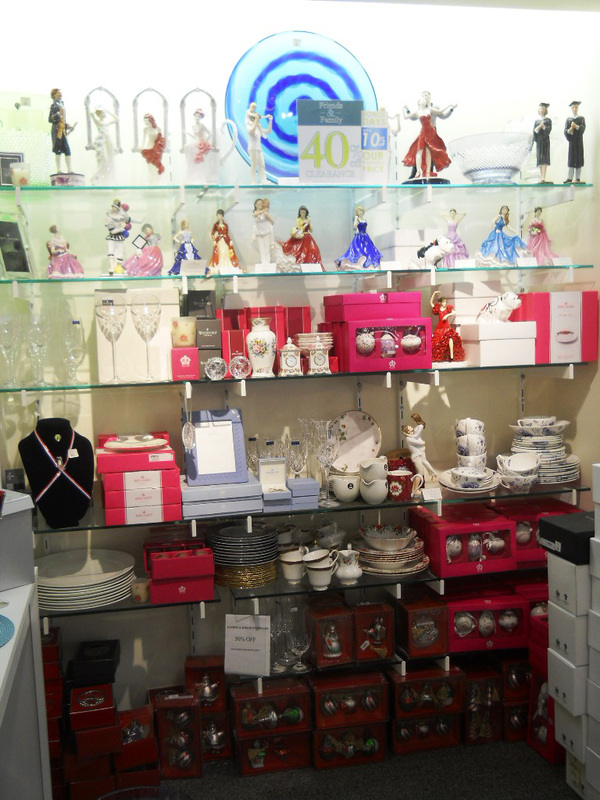 Raffles every hour – Royal Doulton 16 pc dinnerware Sets, Flower Bouquet By Elaine at Ruthie’s Florist, Royal Doulton Pretty Ladies Figurines, Wedgwood Jasperware ornaments, 100.00 Gift Certificate Merrill Construction, Gift Certificates Settlers Green & Much, Much More. Enjoy These Special Lindt Chocolate Shop Specials! 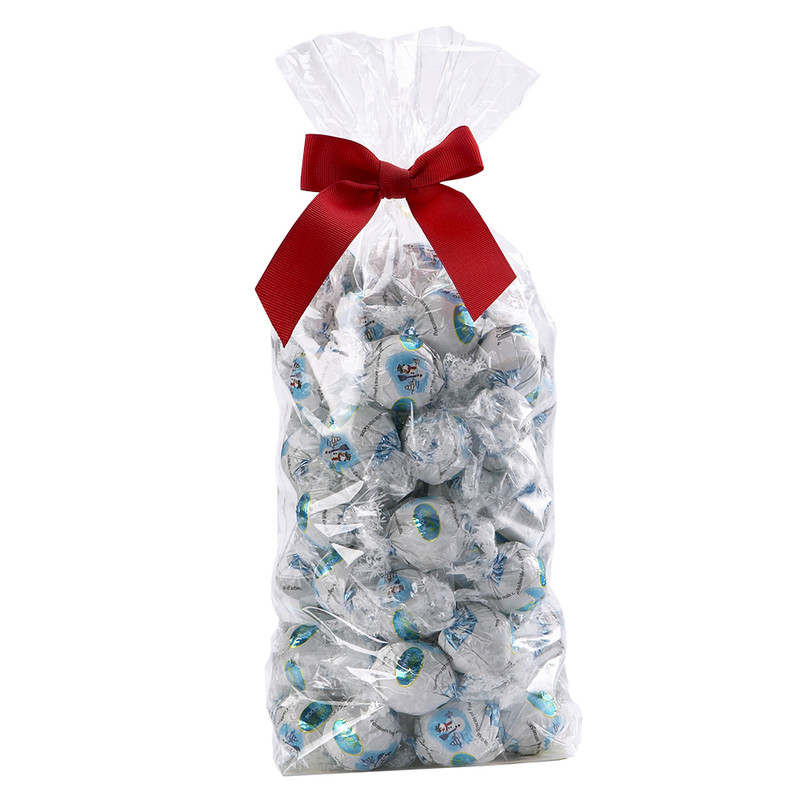 Snowflake Felt Gift Bag: Fill with your choice of 75 smooth melting LINDOR truffles for $25. 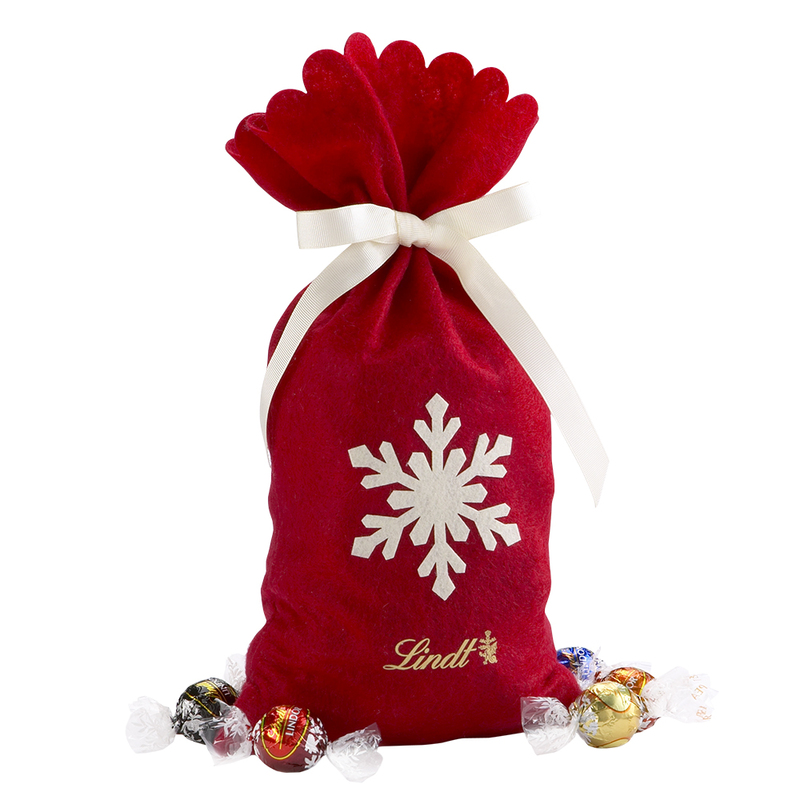 Buy 2 for $40, or 3 for $55: All 75 piece LINDOR truffle bags. Chocolate Figures, Buy 3 for $12. Choose from: Lindt Bear, Reindeer, Santa, Snowman or Mini Holiday Figure 5-pack. 100 LINDOR truffles of your choice for $25! Promotions are subject to change, and are valid while supplies last. Visit a Lindt Chocolate Shop for details. Combined efforts of Eastern Inns, Chamber and Shopping Center Saves Beauty from the Chipper! Heads were turning on Route 16 Wednesday morning when a truck with a giant, 30 foot Christmas tree slowly made its way south from North Conway village. 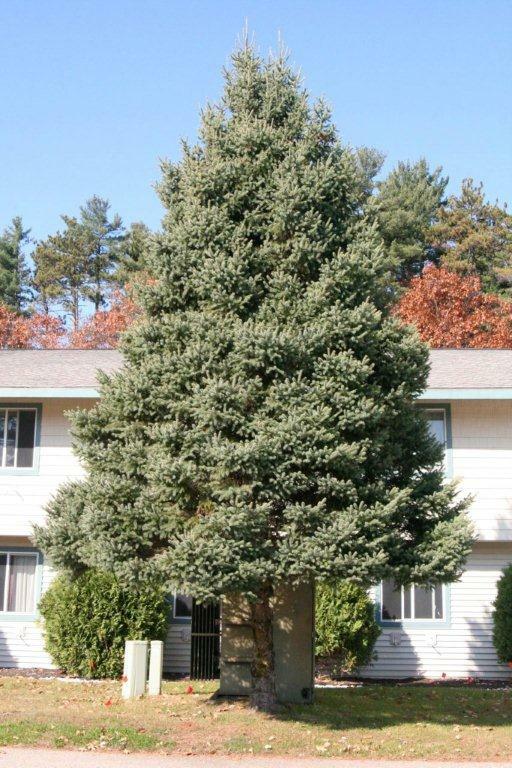 The tree, a beautiful blue spruce, used to grace the front yard of Eastern Inns in North Conway. Sadly, the tree had to be cut down as it was disturbing some underground wiring. Artie Adams, Eastern Inns General manager called the Mt Washington Valley Chamber of Commerce Director Janice Crawford to see if anything could be done to honor the tree’s beauty. Thinking of the annual Lighting of the Rockefeller Center Tree Janice decided to put the tree up for auction at the chamber’s annual meeting, Oct. 30th. Settlers’ Green and Settlers’ Crossing General Manager, Dot Seybold immediately saw an opportunity. So, the deal is done, the tree is cut down and loaded onto the truck for its journey south. 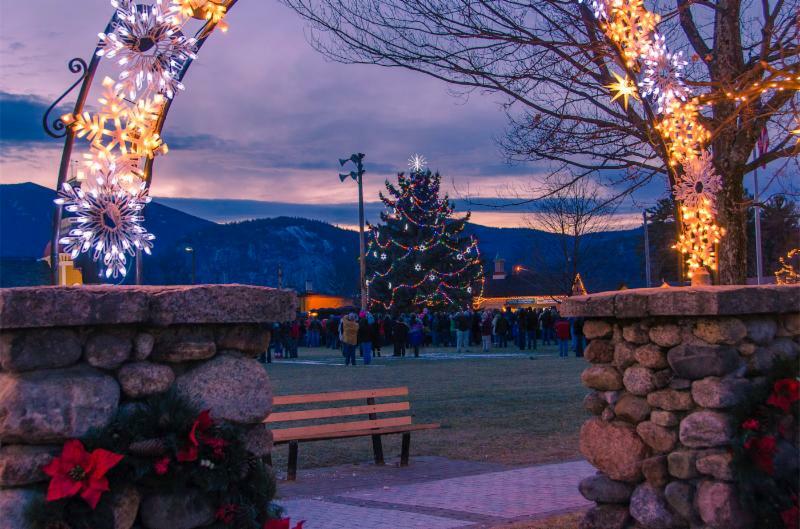 Now festively lit with energy efficient LCD lights, the decorated tree officially marks the start of Christmas and the shopping season in North Conway. The annual Bring a Friend Shopping event this weekend, the official start of holiday shopping in the Valley coincides with the long Veteran’s Day weekend. Settlers’ Green Hosting the Living Dead “Thriller” Flash Mob and more! No fun loving zombie would be caught dead missing the first annual Zombie Walk taking place at Settlers’ Green Outlet Village! Join the hordes of the living dead on Saturday, October 27 from 6:00 pm to 10:00 pm, rain or shine. All events are held in or near the tent in the food court area. Lurch, shamble, grunt, groan and drag your limbs to North Conway’s premier shopping complex for one creepy night of PG-13 fun and fright. There will be many frightful surprises for all and a special something for the first 100 zombies! The evening DJ dancing, movie, Thriller dance and general mayhem are all free. Costumed zombies will have a chance to win a $100 gift certificate and the honor of being crowned Zombie King or Zombie Queen. There will be special prizes for the Best Clown Zombie, Best Prom Zombie, Best Mom & Dad Zombie and more. It’s a $3 donation to enter the contests with all proceeds going to Arts in Motion. Those that need a little touching up can have their make-up done at the Zombie face painting booth hosted by the MWV Children’s Museum expert face painters. Bonfire, a free showing of the hilarious Zombieland on the outdoor movie screen and rocking music with DJ Towsley Tunes will lead up to the real fun. The Kennett HS Dance Team, under the direction of Holly Fougere will entertain with roaming zombie dance performances as they come to life and crash out of their coffins buried throughout the shopping center. The theme is Monster Ball and Lady Gaga and performances will be every half hour until 7:30 pm. Everyone, including Zombies, Corpses, Walkers, Victims and just those wanting to have a little undead fun, are invited to join in the famous Michael Jackson “Thriller” Flash Mob at 8:30 pm. There will be professionally trained dancers sprinkled in with the crowd to lead the classic dance. Be a cool Zombie and learn the moves so we can make this a huge Thriller Dance crowd! There is an instructional “Thriller” dance video by choreographer Hannah Johnson online as well as event details and times. Please visit settlersgreen.com, artsinmotiontheater.com and the event Facebook page at “Zombie Village Featuring the Zombie Walk and Thriller Flash Mob,” for more information. The finale is a parade led by the newly crowned King & Queen and then on to the tented dance floor. The whole thing will be videotaped for YouTube fun. Don’t miss being part of this awesome event! Arts in Motion Theater Company celebrates 20 years of music and theater performing arts in Mt. Washington Valley this year. For more information please visit them online at artsinmotiontheater.com. Settlers’ Green Outlet Village is hosting the event and providing sponsorship support to Arts in Motion for their help in putting on this great evening.